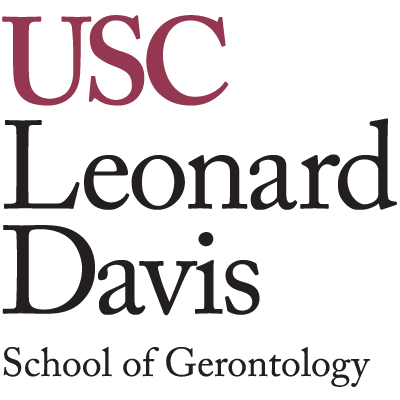 The University of Southern California is home to the oldest and largest school of gerontology in the world—the USC Leonard Davis School of Gerontology. ASA and USC have joined forces to offer an opportunity—exclusively available to ASA members—to earn a certificate of completion from USC in a convenient and flexible online format for $500 per five-week course. Additionally, you can earn CE credits from select accreditation providers when you successfully complete a course. Click here for more CE Credit information. 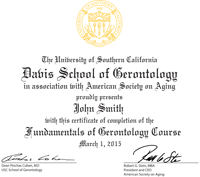 "Innovative online courses presented by the USC Leonard Davis School of Gerontology and the American Society on Aging provided members of the Los Angeles Department of Aging management team with valuable evidence-based aging knowledge," said Department General Manager Laura Trejo. Trejo, who graduated from USC in 1982 and returned to receive her Master of Science in Gerontology and Master of Public Administration in 1987, said her team was able to immediately apply what they learned in the course to their vital work serving the older adults of Los Angeles. Want to learn a bit more about these online courses before signing up? Here's a video featuring ASA staff and USC faculty that covers everything you need to know before you enroll!